Plug into my Simple Freedom Team Training for ideas & support. Get a domain name: Easy to spell. Easy to remember. NameCheap or Godaddy. Vertex Lead System: Login and pick and capture page. Make it primary. Forward Domain: Point domain to your VLS affiliate link. Get Traffic: Keep it simple and just get traffic here. TRAINING: Plug into training here. KEEP IT SIMPLE: Get Your Link & Get Traffic! Welcome to the E1U team! The company runs that one and posts all training calls and prospecting calls. Just click that link and I’ll approve and activate you inside. I have other traffic sources on my training blog but this is my #1 source. Welcome to the E1U team! I’ve posted these resources as a super fast way for you to get plugged in and start generating leads and sales for your Easy1Up business. First, let’s plug you into the Easy1Up community facebook group where you can go if you have questions and to have access to the training updates, prospecting conference calls and other announcements and content from the company. Just click that link and we’ll approve and activate you inside the group. You’ll find the info for the Easy1Up conference calls, training calls, the facebook group and also a review of the marketing funnels you can use to promote the program and also traffic sources so you can start generating leads and getting your message out into the market. I put new updates and strategy session videos there consistently to help you. Feel free to click around there on my training blog for traffic resources, marketing tools, training, strategies and all kinds of ideas and tactics you can use to generate leads and sales in your business. STEP 4: GET YOUR LINK and GET TRAFFIC TO IT! Vertex Lead System: My favorite “all-inclusive” marketing system and traffic source for creating Easy1Up sales. From lead capture pages, presentations, offline and online leads and traffic sources, nothing beats how complete VLS is for building Easy1Up. Everything you need is included. Just get your funnel here and send traffic directly to it. Power Lead System: My “all purpose” universal, generic marketing system tool suite allows you to build your own marketing funnels and pages and includes cutting edge marketing and sales training. The difference is that PLS is a “GENERIC” system and NOT solely focused on Easy1Up so the training you get there is generic, universal and meant to be applied to ANY business opportunity or program. VLS focuses ONLY on Easy1Up. Just pick one if you’re new. Experienced marketers who like to create their own pages and funnels, usually use Power Lead System. Also, affiliate marketers who prefer to promote multiple programs for multiple income streams typically use both. Either way, it’s an efficient way to have professional marketing funnels and internet marketing training to help you close sales. Click here to review PLS. YOU ARE READY TO MARKET! You’re totally ready to go. Just get traffic to your link and plug into our training. What follows below are only OPTIONAL ideas you can think about for your ongoing marketing. You do not have to get anything else and you do not have to do anything else. As long as you’ve setup your business following the advice and resources above, you are COMPLETELY READY TO BUILD! For those of you who would like to learn additional strategies that you can add to your growing business and marketing routine, feel free to review below. STEP 5: SMART PHONE TEXT MARKETING & POST CARDS! TAKE MASSIVE ACTION BUILDING YOUR BUSINESS. Treat your new business like a true, “Start Up Enterprise” and go crazy with promotion, marketing, advertising and business development/networking to get your message out to the market. Social Networks and Internet Marketing are great, but do not let that be the only “universe” you use in your business. People still live their lives OFF THE INTERNET and you can have your messages finding them on their cell phones and in their mail boxes. 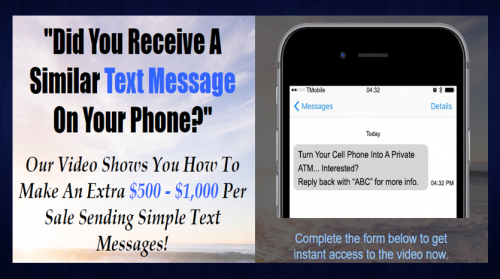 TEXT SMS “Smart Phone Marketing” – allows you to send your promotional short message (with your link) to buyer’s leads smart phones. They see your text message and if interested or curious, they click to visit your website and dial to listen to your 24 hour recorded “sizzle call” message. They then flow into your marketing funnel online. POST CARD MARKETING: Time tested, simple little post cards in your market’s mail box. 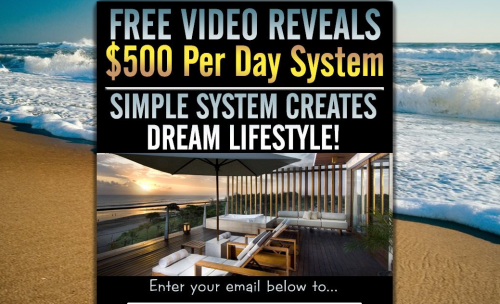 You send out simple little post cards that invite people to learn about a fun, simple way to make money from home. They get your website link and 24 hour recorded “sizzle call” message and cell phone number right from the post card. You can have this all outsourced to buyer’s leads for you or you can get the leads on labels and simply peel and stick labels and a stamp on your post cards and pop them in the mail. No learning curve. No internet complications. No hours of training needed. This can augment your online marketing or completely just keep you offline in your lead generation and using the internet just to deliver your marketing information and take orders. Either way, it’s another creative, simple way to promote your new business and generate prospects. With Easy1Up paying you 100% commissions in juicy pricepoints of $100, $250, $500 and $1,000… these offline marketing methods are sustainable and you’ll earn enough cash flow to keep building your business and teaching your affiliate team to replicate and duplicate these easy to follow methods and create even more passive cash flow from the passups on your team. Click here to review both SMART PHONE MARKETING and POST CARD MARKETING for your Easy1Up Prospecting and Business Development. IMAGE MARKETING: Take these images on this page and use them in your own marketing and promotions. 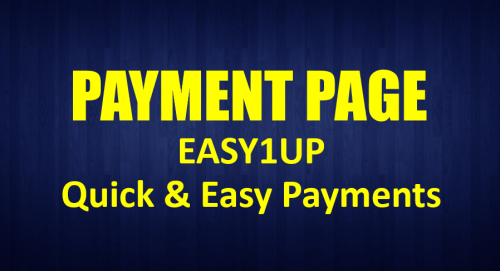 EASY1UP PAYMENT PAGE: Need to Pay for Your Product Package or Upgrade?